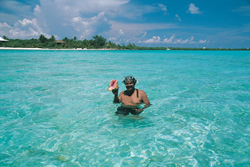 Of the three Cayman Islands, Grand Cayman gets most of the attention. For that reason, Diane Morgan, Hideaways Staff Writer, paid a visit to the "other" Cayman Islands for a vacation filled with sun, fun, and plenty of peace and quiet. Cayman Brac and Little Cayman might not be top travel destinations in the Caribbean, but they have plenty to offer for accommodations, beaches, diving, dining, and exploring. Cayman Brac?s unique topographical terrain makes it ideal for rock climbing and cave exploring. Add that to the plentiful diving, snorkeling, and biking, and you?ve got yourself an action-packed vacation. End your vacation with a quick flight to Little Cayman, where iguanas and conches rule the island. Enjoy the ultimate private beach vacation on long stretches of white-sand beach all to yourself. Learn how to charm the island?s mascot reptile, and which resort offers arguably the island?s best diving excursion.